It looks like the days in which my year-end Top Tens included many DVD innovations have gone the way of the dodo. For each prior list, we got a definite expansion of the format in some way. Whether via the growth of more elaborate and involving music DVDs, the arrival and prominence of TV series season sets, or multi-disc behemoths like the extended edition of The Lord of the Rings: The Fellowship of the Ring and Pearl Harbor, the past few years displayed lots of positive developments. 2003 was more of a "stay the course" kind of year, but I won't complain, since it kept the format on target. Actually, one could argue that 2003 provided the best releases to date, a factor bolstered by all the great titles that don't make my Top Ten. Some years it feels like a struggle to find DVDs that really seem worthy of a Top Ten list, but for 2003, it wasn't a problem. In fact, DVDs 11 through 20 would have been the ten best in many other years. Once again, it remained impossible for single-disc releases to crack the Top Ten. We find a pair of releases with two full discs devoted to supplements, and we also get some multiple-disc, multiple program entries. My year-end Top Tens haven't included a single-disc release since The Nightmare Before Christmas in 2000, and I doubt that trend will change in the future. While 2003 stayed the course in regard to DVD releases, things changed here. Van Tran started this site years ago as a laserdisc page and made the transfer to DVD in the fall of 1998. Van started as both webmaster and reviewer but soon decided to stick with the technical side of things, and I think he made the DVD Movie Guide one of the best-looking and tightest websites you'll find. Van did all this for little obvious reward other than the pleasure of seeing the site become more and more successful, and eventually he decided that he'd done all he could for it. In the summer of 2003, Van chose to move along and pass on the reins to the site. I was very sorry to see him go, as we'd worked very well together over the years, but happily, David Williams ably picked up the slack in regard to keeping the technical elements working smoothly. Hopefully readers never even noticed the switch in management, as we tried to make it seamless. But behind the scenes, Van remains missed, as he deserves so much credit for making this site what it is. Without Van, there literally would be no DVD Movie Guide. He started it on his own and made sure it kept going over all these years. I came onto the site solely as a reviewer, and without his support and technical expertise, the site would never have gone anywhere. Anyway, I just wanted to use this space to express my gratitude to Van for all his hard work over the years. I've enjoyed working on the site and helping make it a reasonably successful enterprise, and I owe the opportunity for this to Van. Here's looking ahead to at least another five years of DVD fun! Make New Line two for two. Just as the extended edition of The Lord of the Rings: The Fellowship of the Ring walked away with the honors as the best DVD release of 2002, it seemed inevitable that a similar package for The Two Towers would do the same. If just to be less predictable, I hoped something else would claim the crown, but despite the hordes of stellar releases you'll find in the space below, none of them quite compare to the four-DVD Towers. It doesn't innovate like Fellowship did, as it uses the same format across the board. However, it combines an excellent movie - reproduced with stellar picture and audio - and adds an almost exhaustingly exhaustive roster of supplements. If anything, Towers offers a better DVD set than did Fellowship, which I didn't think was possible. Can New Line do it again in 2004 with The Return of the King? Don't bet against them. Part of me feels like I should disqualify multi-movie packages like The Alien Quadrilogy from Top Ten consideration, as it seems like the deck is stacked in their favor. However, some could argue in the other direction because so many people won't like all of the films involved; in fact, I'm sure some will subtract points from Quadrilogy because they hate some of the flicks. That won't happen here, however. While I clearly prefer some of the Alien films to others, I enjoy all four, and I found a great deal to like about the excellent Quadrilogy boxed set. All four movies get the deluxe treatment here, with excellent picture and audio plus an enormous and fascinating roster of extras. The Quadrilogy actually gave Two Towers some competition for the top spot, which I didn't think would be possible. In most years, it'd be my easy choice for the best of the bunch, but for 2003, it falls into second by a nose. In any case, the Quadrilogy is a superb package that seems sure to delight for years to come. One shouldn't judge a DVD by the number of discs included - I learned that from the very disappointing 3-platter release of Windtalkers. However, in the case of Black Hawk Down, the final 3-disc product fully lived up to my expectations. I remain somewhat indifferent toward the movie itself, but the "Deluxe Edition" DVD seems absolutely stunning. It duplicates the excellent picture and sound from the original release and adds a massive roster of extras. This version of Black Hawk Down stands as one of the greatest DVD packages released to date. For my Top Tens, I try to balance program quality with DVD quality, so sometimes I put stellar discs below lesser releases that include movies or shows that I prefer. However, sometimes the DVDs are just so darned good I have to put them high on the list. That happened with Black Hawk Down and also with X2: X-Men United. To be sure, I enjoyed X2 and thought it was significantly more interesting than Black Hawk, but I can't say I felt wild about the flick. Still, it's a fun movie, and the DVD seems outstanding. It provides the expected excellent picture and audio plus a genuinely informative and enjoyable set of extras. Chalk up X2 as a good flick and a great DVD. 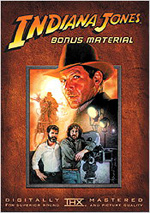 For many others and me, the Indiana Jones movies sat at the top of our DVD wish lists for years. Was The Adventures of Indiana Jones worth the wait? Definitely. The movies all remain excellent and provide a great deal of entertainment. The films look and sound simply terrific, and the bonus disc includes a lot of fine information about their creation. This doesn't equal my dream release of these movies, but it's a fine package that earns a spot high on my Top Ten, partially because I like the movies so much. The set reproduces them well and includes enough good supplements to earn a spot in the upper half of my Top Ten. Another title for which fans clamored for years, The Lion King bowed on DVD in fine fashion. King remains one of Disney's absolute best flicks, as it continues to present a stirring and involving experience. The DVD offers the expected high-quality picture and sound along with a fairly good package of supplements. Those didn't match up with the studio's most packed releases, but they expanded on their subjects well. Chalk up The Lion King as another solid Disney DVD. Leave it to the World's Greatest Rock Band to produce the World's Greatest Rock DVD. The nice Led Zeppelin set clearly has its adherents, but I prefer the Stones' Four Flicks, and not just because I think they're the better band. Flicks includes three separate concerts plus plenty of cool extras and offers them with solid picture and sound. It's the most extensive concert compilation I've seen, and it sets a new standard for the genre. After a dull first two months to 2003, March brightened up considerably in DVD world, and this release of Jonah - A VeggieTales Movie headlined that month. The movie continued the nicely irreverent but moral tone of prior VeggieTales pieces, and the DVD itself appeared very positive. Both picture and sound were quite good, and the set packed a simply outstanding roster of extras. This is one terrific DVD. Officially the most successful animated film of all-time, Finding Nemo kept Pixar's string of hits intact. Personally, I didn't think it compared with the studio's earlier flicks, but it offered a nicely amusing and enjoyable movie nonetheless. The DVD offered the expected high quality picture and audio with a good set of supplements. I can't consider it a truly great package, but it seemed fine enough to make my year-end Top Ten. I'll never regard Sleeping Beauty as one of Disney's best animated flicks, but it stands out for its unique visuals and remains a good effort. The DVD seems particularly solid, especially for a catalog effort. The movie looked great and sounded quite good for its age. The folks at Disney packed the 2-DVD set with many fine extras as well. Despite my lack of enthusiasm for the movie itself, the DVD release of Sleeping Beauty definitely impressed me. SPECIAL YEAR-END EXTRAS: For the statistically minded out there, I tallied the Top Ten by release dates. This found that November produced the highest number of winners with four: Two Towers, X2, Four Flicks and Finding Nemo. October provided two entries, while we got single releases from March, June, September, and December. That meant nothing from January, February, April, May, July or August landed on the Top Ten. For more statistical fun, I examined my four Top Tens by studio. For that span, Disney wins with 14 of the 40 possible slots. Fox comes in second with 10 DVDs, and everyone else brings up the rear. New Line and Sony each nailed four slots, while Warner Bros. filled three and Artisan had two. Universal, Paramount and TGA - the latter produced Four Flicks - both came in with one disc apiece. No releases from MGM, DreamWorks, Criterion or any of the other smaller companies ever landed on the year-end Top Ten, though some of them appeared in the monthly iterations.